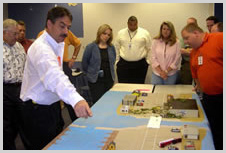 All Hazard Training (AHT), A Division of Early Alert, Inc., provides comprehensive "All Hazard" training designed to prepare organizations to deal effectively with emergencies arising from natural and man-made hazards. The key to successful crisis management is a staff of well trained responders equipped with the proper tools to minimize adverse impacts during crisis situations. The AHT staff works with clients to help identify their risk exposure and to customize a training program to prepare for emergencies, to operate effectively during crises, and to mitigate losses from disasters. AHT education and training uses the most accurate and detailed information available. All our courses meet or exceed nationally recognized standards. All Applicable courses meet the content and objectives outlined in the National Standard Curriculum Training Development Guidance, required by the NIMS Integration Center. AHT services include development of complete customized programs, conduct and evaluation of exercises, and design of comprehensive emergency scenarios for dealing with all hazards or for a specific hazard, such as a hurricane or terrorist event. We develop full-scale field exercises to ensure that each unit of an organization is familiar with its individual responsibilities and is prepared to function as a key element in coordination with other organizational components. Most of our courses and training programs include hands-on tabletop exercises to provide practical experience and to permit participants to acquire an acceptable level of competency to respond to emergencies. Every organization will eventually be faced with an emergency. Will yours be prepared to deal with it? AHT can show you how.